Well, not exactly… after a weekend away running the bike in, it was more like 1,245km. When I bought the bike I also got the Honda Plus card, which extends the warranty to four years and gives you the right to the use of a replacement bike while yours is being serviced, which is great for me as I need the bike daily to go to work. I booked the 1,000km service the same day I picked up the AT to make sure that the replacement bike would be available, and on Wednesday she went in for her first visit to the dealer’s workshop. They took the AT in the moment I arrived and asked how everything was going. I told them about the problem with the 6th gear – occasionally it was difficult to change up into it and then it would jump into neutral – and they assured me they would look into it. I filled in some paperwork and was given, as I feared, a replacement scooter… Well, at least it was not that bad, it was a brand new SH300 and even though I do not like scooters I have to admit that this one made a pretty convincing city runabout. I will go into my riding impressions more into detail in an upcoming post, for the moment suffice to say that it was more than adequate to take to work outside the city until I could pick up the AT the following day. In fact, the bike was ready on the same day, but since I did not finish work until 22:00 I could not pick it up until Thursday. 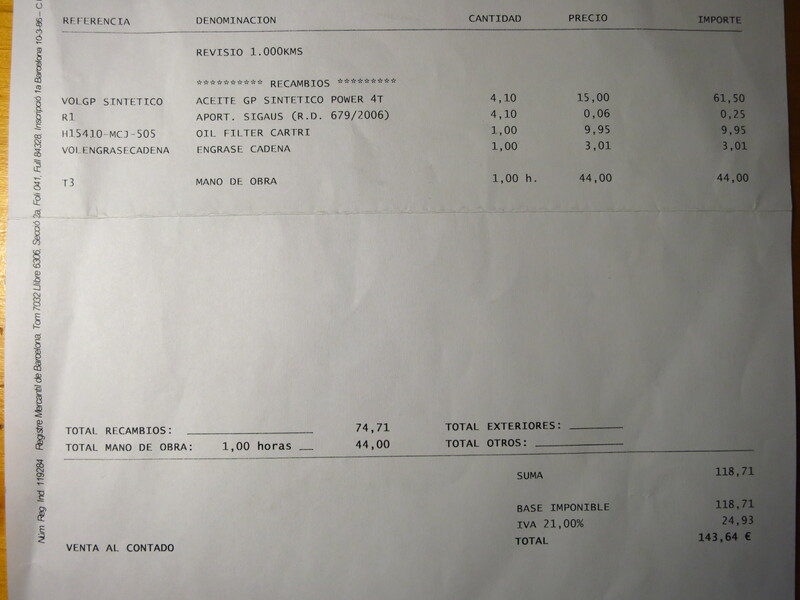 The first service came at 143.64€ and included an oil and filter change and greasing and checking the chain. I had been hoping they would also clean the bike, but they did not… I am going to have to remove the mosquitoes from the weekend myself. The head mechanic told me that he tested the bike himself but having changed the oil he found nothing wrong with the 6th gear. He said that these issues tend to disappear with fresh oil and a bit on running in, and another owner on the local AT forum told me that that after 2,000km the gearbox on his bike had become noticeably smoother. I must say that the problem has not happened a single time since then. All in all, I was quite satisfied with the quality of the service and the price, which was within the average of what I have read about in the forum. Since I was there, took the opportunity to order the tall screen as well. We will see how wind protection improves with it, and if it is not enough, I will fit a deflector on top of it, which was the definitive solution on the Super Ténéré. This entry was posted in Equipment and tagged Honda CRF 1000L, Honda SH300, service by Kilian. Bookmark the permalink. You got screwed by your HONDA DEALER!!! 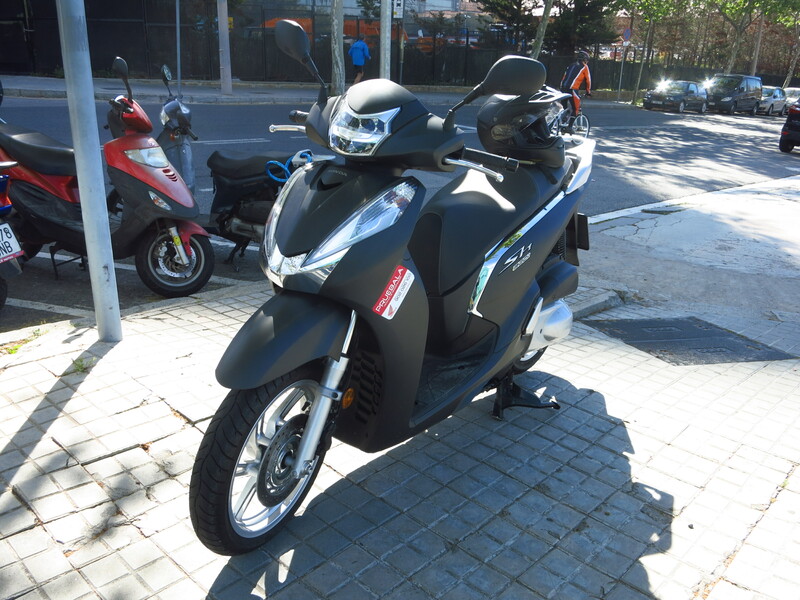 It is in Spain, both in motorbike and car dealers. Where are you from?